In emerging markets and the developing world, access to banking, capital, and financial resources is far more difficult than here in the U.S., due to a less developed financial system, lack of credit tracking, and oftentimes and informal economy. Santa Monica-based Tala, backed by Google Ventures and Lowercase Capital, has developed a tool that allows anyone with a cell phone to build a financial track record, specially for people in emerging markets. The company's CEO and founder, Shivani Siroya, talked to us recently about the startup and what it's doing. Explain what Tala is, and how it works? Shivani Siroya: Tala is a data company that is working in emerging markets. What we've developed, is an Android app that allows us to open up financial access to customers in emerging markets. The really, really exciting this, is in emerging markets, customers have been underserved by financial institutions for years, because they lack credit scores. However, because they are holding a smartphone in their hands, we're able to gather credit data and information on those customers, just through those devices. Through the application we sell, which they can download, within seconds they can give us permission to use key pieces of data on their device, which we run through our credit model. We use hat to create a new kind of credit score for them, which we call their financial identity. Based on that credit score, we can provide them with a credit decision, and open up that financial access to them. We also act as a lender, so after scoring them, we're able to provide credit instantly. For 85 percent of the people, we can provide them with credit in under two minutes. Why this is needed in emerging markets? Shivani Siroya: Across the world, about 2.5 billion people lack access to formal financial services, because they don't have a history, and don't have a credit score. It's not that financial institutions don't exist in those market, but really, because those individuals have been operating in the informal sector. There aren't a lot of digital records on them, or the identity data that allows us to understanding their spending patterns, their revenues and expenses, all those traditional things a credit bureau like Experian or Transunion would use to develop a credit score for them. They just don't have data for that. So, we've thought about what kind of proxy for data we have on them from their daily lives, and we found that all of that daily life data is sitting on their devices. We've developed software, which seamlessly brings that information in, and it's really accurate, valid information. It's exactly the same information needed for a credit score, but brought in a way that changes with a customer's daily life, because we know that our customers face a lot of volatility in their daily lives. What kind of information are you able to assess using just a mobile phone? 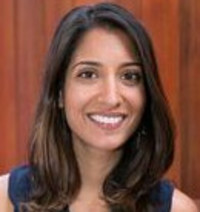 Shivani Siroya: We're bringing in receipts for financial transactions, which are on their devices, such as utility bill payments--so we can see if someone is on time paying for their electricity bill or water ill. We can see marchan transactions, and if they are making e-commerce transactions, if they are paying things at small kiosks. We can see location information, payroll data, bank balances, and savings data. It really goes into two categories, around capacity and affordability. Those are the underpinning behind credit and lending, and figuring out if your customer can repay this loan. Do that have the capability, and the second piece is around behavior and their likelihood to repay. In addition, we use primary and secondary social networking information, in order to verify they are who they say they are. How did you end up starting Tala? Shivani Siroya: I started out pretty traditionally in investment banking, doing equity research at UBS. However, I soon realized I wanted to do something more with my skill set in finance. I found out about Muhammed Yunus and what he was doing with microcredit, so I quit my job and started working in microfinance. I saw that microfinance was improving subsistence living, and moving people from manual labor to potentially having their own business, but I didn't see that they could continue to move up the ladder from the information to the formal financial system. Again, because they didn't have a credit score, they couldn't go get a traditional savings or checking account. In addition, microfinance revolves around group lending, using the idea of hedging risk on a group, rather than on an individual. So we really didn't understand how this was affecting people in their daily lives. I left working on that, an worked on health economics working at the UN Population Fund, working across nine different markets, in India, Subsuharan India, and trying to figure out whether microcredit was improving the quality of life of individuals. We wanted to understand, if we were giving out a $300 loan, whether that loan was going to home improvements, to working capital, for water, or for education. If we could understand the outcomes, we might decide to give them $1000 instead of $300. Again, the biggest issue was that we did not have the receipts. I actually had to go manually, door-to-door, and gather than data myself. I ended up doing 4500 individual interviews, and quickly became a walking QuickBooks. It took me 2.5 years, but I really got to be able to observe the daily lives of those customers. Through that experience, I saw that there wer etwo problems. One, the foundation system for that data layer didn't exist, and second, is in order to build customized products to help those people, we needed data. I went on to search to find where that data was, and realized that living in these marketplaces you would get receipt data on your device, so the next step was to develop software and applications to pull those into our system. Since your work at emerging markets were mostly overseas, how is it that Tala is located in Santa Monica? Shivani Siroya: It's a little bit by chance, and a little bit by choice. I love LA now. After working at the United Nations, I told myself that investment banking didn't look that bad, so I went back to M&A at Citigroup. When I was there, I was transferred toa project called Healthnet here in Los Angeles. I was working in their corporate M&A department on a large acquisition project, and then ended up starting the company when I was here. I've been loving it and plan on staying here. What's the biggest challenge you've had to overcome so far in your startup? Shivani Siroya: One of our obvious challenges, is we're a global company. We have offices in Santa Monica, and office in Nairobi, and one in Manila. That means we are working across different time zones 24 hours a day. There is obviously the challenge of making sure our team is really focused an in sync at all times. I think we've really come up with some communications hacks, and ways to make sure that we stay connected all the time, and align around our priorities. But it's still a big challenge. Also, as you mention, we're far away from our customers. All the work we do is digital, so we have to think how do we get that data. We don't just believe in having data, we look at the actual stories behind that data, and make that data come to life. I myself, I spent time in all of our markets once every other month, and the same for the rest of the leadership team, customer service team, and product team, to really make sure we can get those insights into our customers. We're constantly posting customer stories, and making sure they are front and center at our company. Shivani Siroya: We're in Kenya now, and are continuing to expand globally. The big thing we're focusing on now is vertical expansion, thinking about how to take financial identity beyond credit. Credit is not the end all, be all for customers. Our mission is about delivering access, choice, and control to our customer, throughout their financial lives, and to go the extra mile to further that relationship with them. Our team has grown 67 percent in the last six to eight months, and we'll continue to grow next year and the year after, in LA in particular. We want to bring on some really great, talented folks to the company.